Tyros Pro V2 is a complete rebuild of our original Tyros theme. With a modarnized look, improved mobile responsiveness, pixel-perfect design, Tyros Pro is a theme that is guaranteed to dazzle your site viewers. 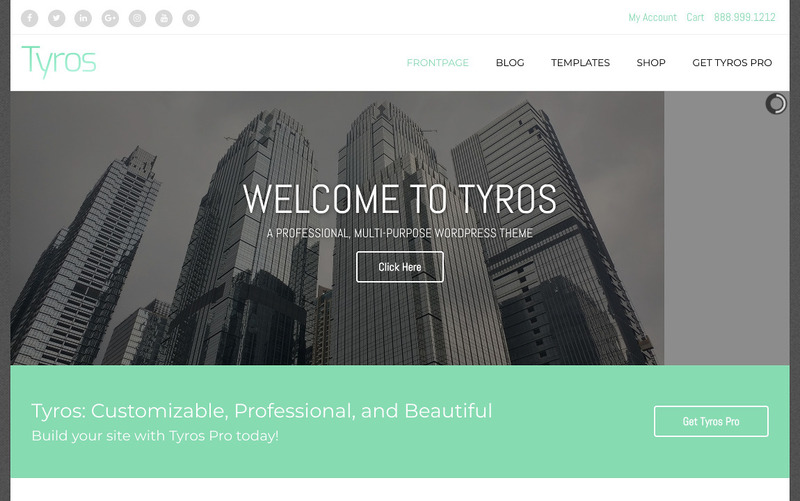 Tyros is a user-friendly theme, with tons of features, content types and customizations. You can use Tyros Pro to build a professional site quickly and painlessly. Tyros Pro is also integrated with WooCommerce, allowing you to build an online store, with a complete product management and payment system, fully integrated into the theme. Still un-decided ? Take a look at the Tyros Pro version demo! Buy Tyros Pro – V2 today! Stay safe online with our secured payment options by SSL protocol. The green lock icon that shows up next to the URL proves the security of your connection so you can feel comfortable and secure using our site. All prices are listed in US dollars.